Texting rather than talking. Gathering “likes” and followers. Making friends via a gaming console. Unrelenting 24/7 news cycles. Ready or not, the rise of social media and 24/7 Internet access has changed the way we relate to one another (and ourselves), leaving in its wake a whole new set of challenges for those who use it. The girl who can’t put her phone away during session. The boy who isn’t sleeping after reading messages on social media. “Friends” of all ages who shame each other for life choices and argue by text. The socially anxious young adult who struggles to meet people in person because all of his “friends” are online. The parent who has to contend with “Facebook shaming” for every parenting decision. The older adult who feels out of touch and disconnected. The impact is rampant and pervasive – as a result, treatment of anxiety doesn’t look the same anymore. Evaluate the impact persistent “screen time” exposure can have on the neurobiological and psychological health of clients. Implement strategies to effectively reduce excessive use of technology that leads to avoidance and increased anxiety. Increase clients’ capacity to utilize technology in a healthy manner to decrease risk of anxiety and other mental health symptoms. Establish clinical practices that decrease rumination and build resilience to the stress of the digital world. Teach clients five strategies for overcoming irrational fears of social interaction in order to improve clinical outcomes. Implement cognitive-behavioral strategies for challenging distorted beliefs and the “comparison fallacy” as related to online interactions. Margaret Wehrenberg, Psy.D., a licensed clinical psychologist, is the author of 6 books on the treatment of anxiety and depression, including, You Can Handle It: 10 Steps to Shift Stress from Problem to Possibility (PESI, 2017) and The 10 Best Anxiety Busters (W.W. Norton, 2015). An expert on the treatment of anxiety and depression, she also has extensive training and expertise in the neurobiology of psychological disorders. She earned her M.A. specializing in psychodrama and play therapy with children. Dr. Wehrenberg has years of experience as a drug and alcoholism counselor, working with the U.S. Army in Germany and Lutheran Social Services in Illinois. She also has training in trauma treatment, EMDR and Thought Field Therapy. She has a private psychotherapy practice in Naperville, IL, specializing in treating anxiety. In addition to clinical work, she coaches business professionals on managing anxiety, she frequently contributes articles for The Psychotherapy Networker magazine, and she has produced Relaxation for Tension and Worry, a CD for breathing, muscle relaxation and imagery to use with anxious clients. 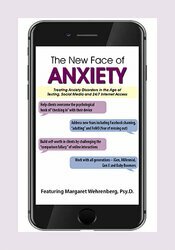 Her book The 10 Best-Ever Anxiety Management Techniques, 2nd Edition (W.W. Norton, 2018), is a consistent top seller for anxiety management. Nurses completing these self-study materials will earn 6.3 contact hours. Expires: 12/13/2021. PESI, Inc. designates this self-study activity for a maximum of 6.0 AMA PRA Category 1 Credit(s)™. This activity was originally recorded on 12/13/2018. It was last reviewed on 9/6/2018 and is valid until 9/6/2021.